One of the biggest developments in recent franchise history gets an unconventional copycat this weekend with one of the more unexpected stars to headline it, as Universal attempts to create its own world of film. The Mummy is the first film in Universal's proposed “Dark Universe,” a series of films encompassing a wide array of famous movie monsters, which will one supposes come together in some sort of Infernal Injustice League somewhere down the line, assuming things work out like they want. 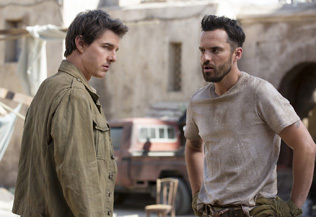 Looking a bit like a supernatural Mission: Impossible, it stars Tom Cruise as a mercenary treasure hunter who stumbles upon a tomb, which turns out to have been a prison for an Egyptian princess (Sofia Boutella, who Hollywood is trying to make a Thing) who made a sinister deal with a god, and who was mummified alive as punishment. When she is accidentally awakened, she tries to pick up where she left off in dominating the world by recovering some macguffin that's located in London, and attempting to adopt Cruise as a minion. Enlisting the help of Russell Crowe as one Dr. Henry Jekyll (oh), this leads to a great series of action set pieces and a lot of CGI sand. This version seems to eschew the humor of the 1999 version of this series, which blended Indiana Jones style adventure with a touch of horror. As a launch for the proposed series, using The Mummy makes some sense, given that it's been a successful series in the recent past and may be able to capitalize on nostalgia for that film, even if the two are very different. Cruise is a weird pick to make into its star, though, as it seems like it's the kind of thing that's below him to piggyback into a franchise. Universal has huge plans for this, though, signing names like Johnny Depp and Javier Bardem for future movies. This is, of course, not the first time they've tried to make this idea work, though 2014's Dracula Untold generally gets swept under the rug these days, and if you administered some sodium pentothol to Universal execs, you'd probably get them to admit that 2010's The Wolfman was an attempt to do this as well. While title recognition and star power is working for them in this case, the critical reception is not, with the film being savaged as generic action and a really joyless slog. If this derails Universal's big plans, it'll be a remarkable change of fortune for one of the world's biggest stars. Indeed, things are not looking well and it should open to just $35 million. Straight horror is handled by It Comes At Night, which answers the question, “what if the end of the world got worse?” Joel Edgerton stars as a man who hides his family away in a cabin in the woods after some unspecified calamity has affected the world, leading them to a paranoid subsistence lifestyle. A new group of survivors (?) stumbles upon them, leading to personal conflicts as he attempts to hang to his rules for survival. This includes the big one – no going out at night.